You might remember the trouble I had with foxes last July. We lost our whole flock of chickens (20+), as well as our two Indian Runner ducks, in a single night. I’ve held off on getting more chickens until I could secure the pen – obviously I never want something like that to happen again. We did get some ducks along the way, but I’ve been locking them up in the shed at night and letting them out into the pen each morning. We also got a dog not long after that attack, and I’ve been placing her droppings around the perimeter of the pen to ward off predators. It’s taken a while, but this weekend I finally got some time to put my Predator Protection Plan into practice! My original plan was to create a smaller secure pen, and turn the remainder of the existing run into separate breeding pens. It would have been less work in the short term, but then I’d have to make sure each breeding pen was also built securely. 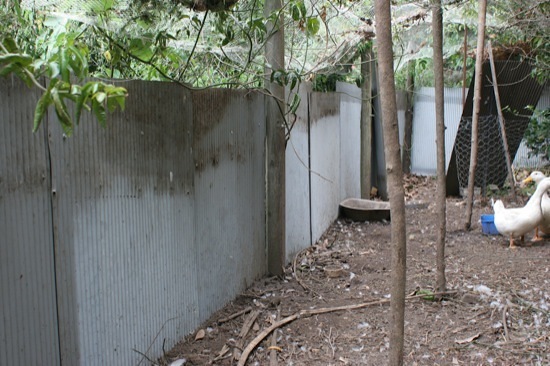 If I could completely secure the perimeter of the existing large run, then I could later build simple breeding pens inside it without needing to fox-proof every one of them. Note: clever though it sounds, burying a skirt of chicken wire around the pen didn’t stop the foxes from digging under. The wire was a very light gauge, and although galvanised, it rusted and was easy to break through. In a later attack, a fox even chewed right through a non-rusted piece of this wire! Chicken wire keeps chickens in, not predators out. I bought sheets of “ripple iron” (like corrugated iron, but with smaller corrugations) from a recycler a while ago for $4 each. I dug trenches between the posts on the inside edge of the pen, about 1.5 feet (45 cm) deep. I then screwed the sheets of ripple iron to both of the rails and backfilled the trenches. I got five sections – each with three pieces of ripple iron – done on Saturday, despite the rain. I’ve still got one section to go, and then I just need to secure the pen door. The ducks enjoyed all the digging, and received a good few worms as reward for their patience. Below are the Indian Runners now – they’ve grown a lot since we got them as week-old ducklings in October, and should be laying soon! 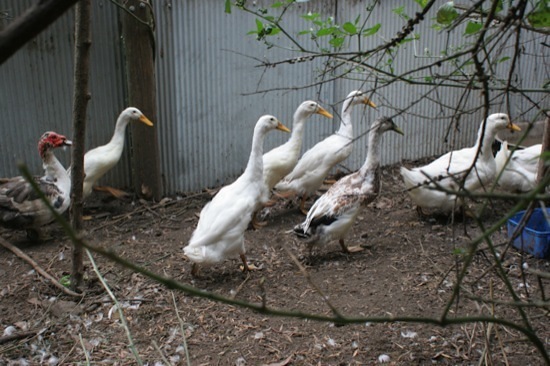 The front two ducks in the line are Pekins, and the warty grey-and-white one at the rear is our Muscovy drake. Construction went a lot smoother than I was expecting, and I was really pleased with the end result. I can’t see a fox getting through that! Looks great, more photos of the dog required though, she must be getting big by now! @Julie: I’m thinking that way too. We’ve lost a couple of chickens to curiosity, when they poked their heads through the chicken wire and had them bitten off by a fox. You need very strong wire (maybe even welded mesh) with small holes, at least around ground level (up to about 1.2m high). 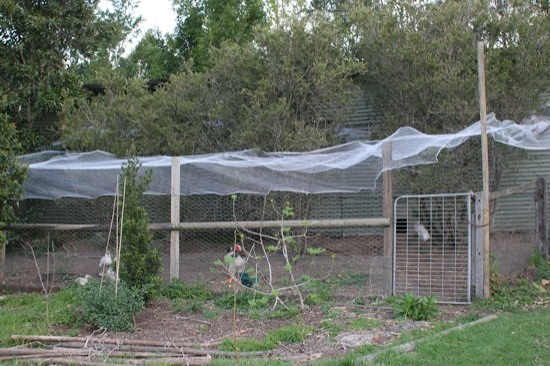 The upper parts of the perimeter can be chicken wire, and the roof can be something like bird net. I learnt from a grizzly experience that the chook pen has to be fully enclosed (including the floor) with chook wire. I used a double layer in the end. I then let the grass grow through the chook wire on the bottom. Foxes can dig underneath to get it to a chook shed and they will for a bit of fun for them…! My girls were then happy and layed eggs. I borrowed my friends dog and it it did was scare the chooks and some of them stopped laying. Sorry to be the bringer of bad news but now my girls are happy, healthy and i can comfortably sleep at night! @Julie: I’d go for something stronger than chicken wire on the floor (our fox chewed straight through normal chicken wire! ), and try to find something that won’t rust over time. Something like 3 or 4 mm galvanised welded mesh. I’ve buried solid sheets of ripple iron 1.5-2 feet deep all around the outside of the pen, though, so I don’t feel I need anything on the ground. At the gate, I’ve buried 2-foot-long pavers vertically. I don’t think a fox would be able to dig under that.